Our '55 T-Bird restoration project is moving along well, but weather (humid, summer weather that is) prevented us from spraying the body with urethane primer. Since we had the time, and some free space in our inside workshop, we thought we'd show you how to stretch new vinyl and padding onto a dash. This can be a troublesome project, so we approached it with patience and forethought. Here's how it's done. We had stripped, sanded and painted the bottom of the dash at the same time we'd painted all the other (white) interior trim pieces. The original paint on the top of the dash was in very good condition so, since it would be covered in vinyl, we sanded it smooth rather than waste paint. Next, we laid the new vinyl cover over the dash to determine how much extra material was available for stretching tools (hands, mostly) to grab. 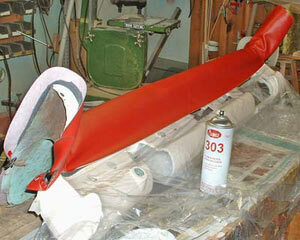 The next step was a careful masking of the fresh painted area with thick plastic sheeting. This would protect it from scratches and glue residue. 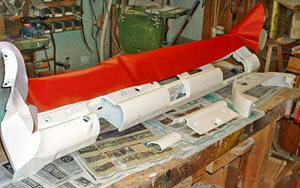 The dash bottom, ash tray, glove box and gauge cluster console are painted and ready for the next steps. It's always a good idea to check whether your material will fit so that you can be confident during the working stages. 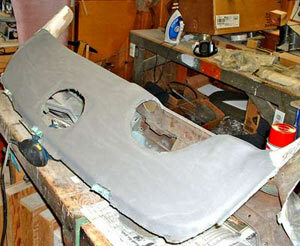 The foam is laid carefully onto the glued surface so that no wrinkles are left. Thunderbird dashes were vinyl covered originally, but the vinyl wasn't padded. 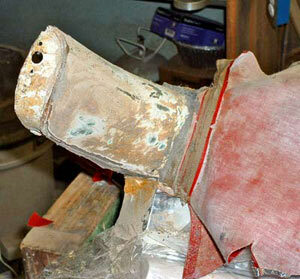 Instead, the factory simply glued the material right onto the metal. We wanted a more tactile feel (and softer look) for our dash, so we next installed a thin, medium-density foam pad over the metal using spray contact cement. Although the foam was only 1/4" thick it would make a world of difference. 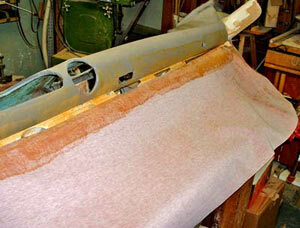 We laid the foam a small amount at a time to keep the surface from bunching up as the glue grabbed it. 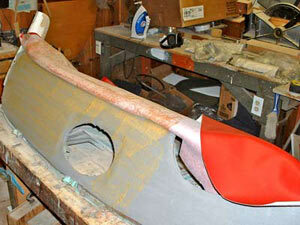 The finished foam covering is smoothed out and all instrument/latch/fixture holes are cut out with a razor blade. Clamping the vinyl in place shows where the trouble spots will be. We then placed our vinyl covering over the dash and stretched it from side to side, fastening it at each end with paper clips. No glue was used at this time, however, as we wanted to see how it would fit over the gauge areas and around the "end wings" of the dash. We could see that the material would bunch-up in those areas, so that meant we'd have to do some careful stretching to get the material to lay flat. We laid the vinyl upside-down at the lower front lip of the dash and sprayed a thin (about 2 inches wide) line of glue onto it and the mating area of the foam cover. We chose the lower lip area to start because it's the straightest, flattest area of the dash. From this point we moved in 4-inch sections, gluing, stretching and adhering the vinyl as we went. Doing so gave us the ability to lift and relocate the material if wrinkles appeared, which — of course — they inevitably do. The glue is cured and we're ready to stick the surfaces together, but only after stretching the vinyl a bit from end to end. 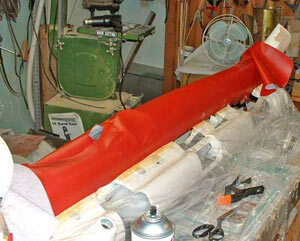 This shows the process of gluing small sections at a time. If the whole area was adhered it would be nearly impossible to remove the vinyl without destroying it. The main portion of the dash looks nice, so here we go to the gauge area. 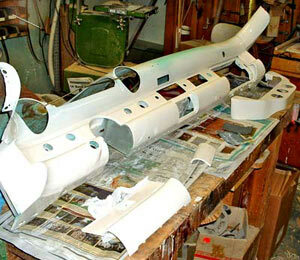 Notice the depression where the speaker grille will be attached, and the two end wings which have not been glued yet. These will be left for last. 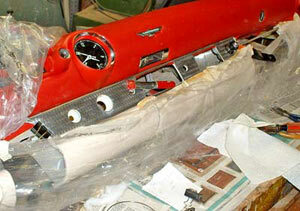 Once the vinyl was stretched over the main area of the dash we stopped to address the wrinkled areas around the gauges. Since there is dramatic curvature in these areas the vinyl will wrinkle, even though it's stretched. These will be further stretched (sometimes with the use of a heat gun) to pull around and under the openings. 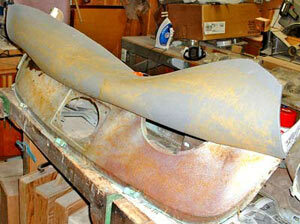 We left the vinyl alone for a few hours to allow the contact cement to set up and cure. Coming back to it we carefully cut out vinyl covering the instrument holes, leaving enough overage to pull and glue to the underneath of the dash. There's no "secret" to getting the wrinkles around the openings smooth, just stretching, smoothing and lots of patience. It took us over two hours to stretch the wrinkles out of the openings sufficient to install the gauges. Notice the wrinkles over the "eyebrow" of the round instrument hole. We test-fitted the speedometer cluster after some smoothing just to see if we'd done enough. No vinyl was glued to the underside as yet, only held in with tape. We're almost there! 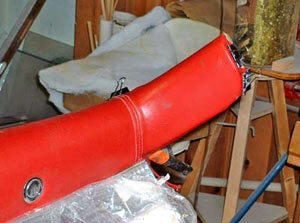 There are very few wrinkles left to stretch out, so we can remove the instruments and do the final tweaking. We determined that the best way to stretch the remaining vinyl over the end wings was to do so without the foam padding. This is one of those situations where you have to be willing to change plans from time to time. We found that the compound curvature of the wing areas required strong adhesion to keep the vinyl in place and the foam simply wouldn't hold without shredding. That's why, no doubt, the factory didn't use foam backing on the original cars. This operation went pretty well, with just a few wrinkles left to stretch out. Once we glued the material to the metal we wrapped it around the edges and glued/taped the underneath. What About The Vinyl Edge? 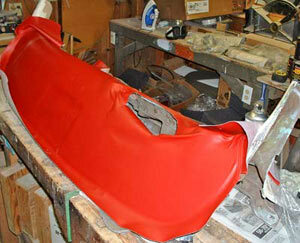 The edge of the vinyl that is glued around the front curve and onto the vertical section of dash remains in place. Over it is installed the machine-turned aluminum trim that runs across the dash and onto the doors. 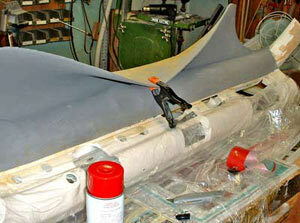 With the foam stripped off we were ready to glue the vinyl directly to the metal and roll it around the edges. It looks pretty good, doesn't it? The clamps will be left in place until the dash is installed and the chrome trim is attached to the ends. Notice the glove box lock, neatly protruding through the padded dash. 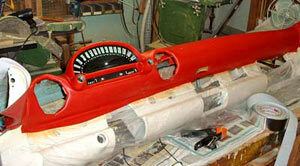 The aluminum trim is clamped into place, to be held rigidly by the control switches and radio knobs.